Mazda 5 diesel driven | What Car? Mazda's new 5 MPV has been on sale in the UK since last October, but buyers have had to wait until now if they wanted anything other than a petrol engine. Many will have done just that. Diesel was the preferred choice of nearly half of buyers of the old 5, and Mazda reckons the diesel take-up will be even higher on the new model. On paper, the 113bhp 1.6-litre turbodiesel engine looks like it might struggle in an MPV capable of hauling around up to seven people. In reality, though, it's strong enough for most buyers. It offers more pulling power than either the 1.8- or 2.0-litre petrol versions higher up in the rev range, and is refined enough as long as you don't thrash it. It's a bit gutless at low revs though. Whichever engine you choose, the Mazda's trump card is the way it handles. Compared with most seven-seat MPVs, the 5 is surprisingly agile, and it doesn't lean through corners as much as you'd expect for such a tall car. It's a shame the steering doesn't offer a bit more feedback, though, and the stiff suspension means the ride is quite firm although it isn't uncomfortable. 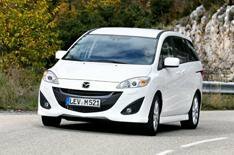 Diesel versions of the Mazda 5 start at £20,650, £2500 more than the 1.8 petrol (although the petrol does have less standard equipment). Still, that's a hefty premium. However, the diesel is a lot more economical, averaging an impressive 54.3mpg. CO2 emissions of just 138g/km mean it's also one of the cleanest seven-seat MPVs on the road. Given that the diesel is also predicted to hang on to its value better than petrol models, it should work out cheaper in the long run for high-mileage private buyers. The majority of company car drivers will also be better off choosing the diesel, because it sits in a lower band (19%) for company car tax. Like most seven-seat MPVs, the 5 has two seats at the front, three in the middle row and two that fold out of the boot floor. The seats right at the back are easy to flip up and down, and they fold flush with the boot floor to leave a flat loadbay. Those in the middle row slide back and forth, and there's plenty of travel in the runners, so you can share out the legroom to customise the cabin for a variety of situations. Sliding rear doors also make it a doddle to get into and out of the 5. However, while many rivals have three individual seats across the middle row, the 5 doesn't instead the centre seat folds out from the base of the one next to it, and it's very narrow. Folding down the seats in the middle row is a pain, too, because you first need to flip up the seat bases. Practically speaking, then, the Mazda is good but not great. The hard and scratchy cabin plastics feel disappointingly cheap, too, although the cabin does feel solidly screwed together.